In today’s review we take a look at Fox Interactive’s Die Hard Trilogy compilation. Can Probe Entertainment port the Playstation classic to the Saturn and retain its intensive particle effects, multitude of character models and overall detail? Read our full review to find out what we thought of their efforts. Click here to read the full review of Die Hard Trilogy on SEGA Saturn. This review can also be accessed from the SEGA Saturn section of our First Party Reviews section. This entry was posted on Sunday, September 25th, 2016 at 11:36	and is filed under Review. You can follow any responses to this entry through the RSS 2.0 feed. Both comments and pings are currently closed. 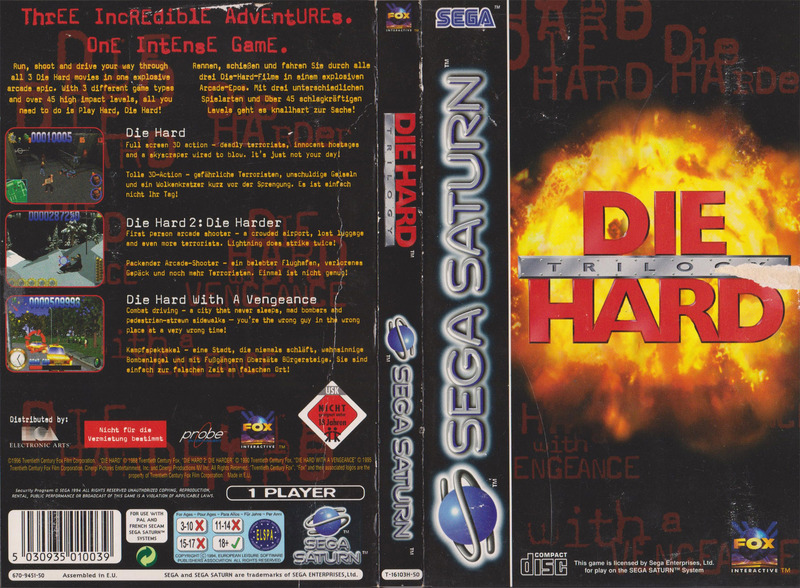 The PlayStation version of Die Hard Trilogy was and still is one of my favourite titles on the platform. I recall a friend having the Saturn version and realising how jittery and sluggish it felt compared to the PlayStation version. It’s a shame as it’s a great game (well 3 games in one) and is well worth playing, but possibly more so on the PlayStation.